In this review, a concise practical guide for clinicians involved in leading a resuscitation of the thermally burned will be provided. In addition, we review the current controversies and the application of potential adjunctive therapies when faced with a difficult resuscitation in an effort to avoid "fluid creep". Typically, patients are at risk for developing burn shock if they have greater than 20% of their total body surface area (TBSA) burned. Factors such as the depth and extent of the burn, pre-existing illness, and the presence of inhalational injury greatly influence the magnitude and duration of shock. Burn shock physiology can be divided into two phases; the emergent phase and the flow phase. The primary goal of fluid resuscitation after severe burn is to maintain adequate tissue perfusion to the end-organs with intravenous crystalloid in an effort to avoid ischemic injury at the lowest physiologic cost. Extreme difficulty of this task is related to the pathophysiologic changes described which occur during the emergent or ebb phase immediately postburn. The profound capillary leak combined with the potential for cardiac compromise leading to hemodynamic collapse makes adequate resuscitation of these patients extremely difficult. Delayed or inadequate replacement of intravascular volume results in suboptimal tissues perfusion. Suboptimal tissue perfusion results in end-organ damage that may become irreversible and ultimately contributes to death. Fortunately, under resuscitation is relatively uncommon since the adoption of weight and injury-based resuscitation formulas. On occasion, however, the patient can develop a concurrent distributive shock which necessitates additional volume to maintain adequate perfusion. Fluid resuscitation with crystalloid is the cornerstone of initial burn management. Various formulas have been developed over the years that estimate the fluid requirements in the first 24-48 h [Table 1]. 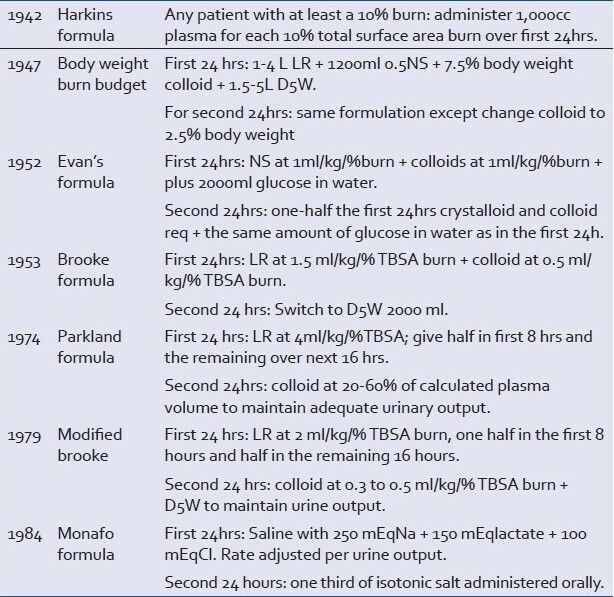 Perhaps the most commonly used formula is the Parkland formula which estimates 4 mL/kg/% TBSA of total volume in the first 24 h after burn injury. From the total fluids calculated, it is estimated that half will be administered over the first 8 h, and the rest given over the next 16 h. A number of recent authors have recently reported that this formula significantly underestimates actual fluids received. ,,, Other authors have noted that that the Modified Brooke formula, which estimates a total volume of 2 mL/kg/%TBSA over a 24 h period, also underestimates the actual resuscitation volumes received. In fact when the two formulas were compared head-to-head in a retrospective case controlled study, the higher the initial rate, the higher the final resuscitation volume at 24 h.  In this report, those who had a resuscitation based on the Modified Brooke formula group ended up requiring approximately 3.8 mL/kg/%TBSA; while those were started on fluid rates based the Parkland formula ended up requiring approximately 5.9 mL/kg/%TBSA (P < 0.0001). A greater percentage of patients in the Parkland group exceeded the Ivy Index, defined as 24 h volumes exceeding 250 mL/kg (57% vs. 29%, P = 0.043). This was found to be an independent predictor of death based on multivariate logistic regression. No difference was detected between the two groups in terms of other clinical outcomes such as the incidence of lung injury, kidney injury, and ACS, as well as ventilator days, ICU days or death. Many authors agree that the most important variable during the resuscitation of a severe burn patient is the careful bedside titration of the hourly fluid based on the compilation of various clinical end points. Thus, it is reasonable to believe that the starting point is almost irrelevant due to the complex nature of the body's response to burn injury. It is important to emphasize that this method of deriving the initial fluid rate should not be applied to pediatric burn patients. In a recent guideline, the American Burn Association recommended that pediatric patients with thermal burns are resuscitated with initial fluid rates derived by the Parkland formula. In addition, due to rapid depletion of glycogen stores in fasting children, sufficient glucose substrate is required in the first 24 h of the resuscitation. This can be achieved by the addition of dextrose containing maintenance fluid to the resuscitation fluid or by initiation of early enteral feeds. Despite timely and adequate fluid resuscitation, many patients with severe burns will develop refractory burn shock leading to a "runaway" resuscitation. As such the following adjunctive therapies may be required. Despite some reservation with the use of albumin in the early phases of burn resuscitation, recent work by Cochran et al. demonstrates a decreased likelihood of death. In a recent case controlled study, Lawrence et al. demonstrated that the addition of colloid to crystalloid resuscitation rapidly reduced hourly fluid requirements and ameliorated fluid creep. We routinely administer albumin as early as 12 h postburn in patients in whom we project a "runaway" resuscitation at 12 h [Table 3]. In the previous study mentioned, 40% of all patients received 5% albumin after 12 h.  In select patients, after carefully weighing risk and benefit, fresh frozen plasma may play a role in decreasing resuscitation morbidity. In a prospective randomized trial, O'Mara et al. demonstrated decreased overall fluid volumes and lower intra-abdominal pressures when comparing a crystalloid resuscitation versus one supplemented with fresh frozen plasma. Using high dose ascorbic acid, 66 mg/kg/h for 24 h, Tanaka et al. found that adjuvant ascorbic acid administered during the first 24 h after thermal injury significantly decreased fluid administered compared to control (3.0 vs. 5.5 mL/kg/%TBSA, respectively, P < 0.01). High dose vitamin C therapy may be considered as an adjunct in those at risk for fluid overload. Originally described almost 30 years ago, the plasma exchange is thought to be effective in removing the circulating mediators responsible for the phenomenon of burn shock. According to a study performed by Neff et al. when therapeutic plasma exchange was utilized as a salvage maneuver, significant physiologic improvement and cessation of increasing fluid rates occured. Also, both MAP and UOP greatly increase while lactate levels decrease. Prospective data are lacking to widely apply this method for patients at risk for over-resuscitation. Another method of extracorporeal blood purification is hemofiltration. Clearance of molecules of middle molecular weight (up to 50 kDa) is possible via convection as delivered by hemofiltration. Our group recently demonstrated an absolute reduction of 33% and 23% in 28-day mortality and hospital mortality in critically ill burned military casualties with acute renal failure (n = 29) aggressively treated with high volume continuous venovenous hemofiltration (CVVH) when compared to a closely matched historical cohort (n = 28). In a subgroup of patients with shock (n = 21), a majority of them with septic shock, we observed a dramatic reduction in the vasopressor requirement at 24 and 48 h that did not exist in the historical cohort (*P < 0.05 both to baseline and between groups). Due to potential effects in reversing shock, we believe this mode of therapy may have a potential role as a salvage maneuver in patients with burn shock undergoing a "runaway" resuscitation. Optimal care for the seriously burned patient should start with prompt recognition and evaluation of the burn. Once that has been established, resuscitation should be initiated via a simple formula right away. The initial fluid rate is not as important as the actual resuscitation itself guided by an attentive bedside clinician. Fluids should be titrated based on a compilation of various end points with the main goal of maintaining urine output 0.5-1 cc/kg/h, or roughly 30-50 cc/h. 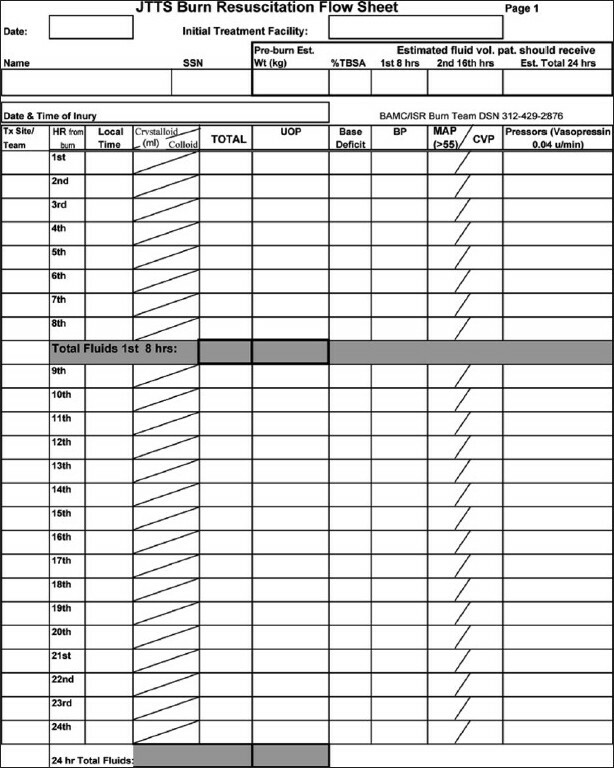 Best results are obtained by tracking the resuscitation on a separate flow-sheet. The need to define better endpoints of resuscitation to avoid excessive volume administration represents a high priority for future investigations. Additionally, the role for various adjunctive and salvage therapies when anticipating a "runaway" resuscitation must be carefully considered weight risk and benefit. Many of these adjuncts will need to be defined more clearly by future clinical trials. 1. Sneve H. The treatment of burns and skin grafting. JAMA 1905;45:1-8. 2. Blumetti J, Hunt JL, Arnoldo BD, Parks JK, Purdue GF. The Parkland formula under fire: Is the criticism justified? J Burn Care Res 2008;29:180-6. 3. Bhat S, Humphries YM, Gulati S. The problems of burn resuscitation formulas: A need for a simplified guideline. J Burns Wounds 2004;3:7. 4. Chung KK, Wolf SE, Cancio LC, Alvarado R, Jones JA, McCorcle J, et al. Resuscitation of severely burned military casualties: Fluid begets more fluid. J Trauma 2009;67:231-7. 5. Pruitt BA Jr. Protection from excessive resuscitation: Pushing the pendulum back. J Trauma 2000;49:567-8. 6. Supple KG. Physiologic response to burn injury. Crit Care Nurs Clin N Am 2004;16:119-26. 7. Youn YK, LaLonde C, Demling R. The role of mediators in the response to thermal injury. World J Surg 1992;16:30-6. 8. Baxter CR, Shires GT. Physiological response to crystalloid resuscitation of severe burns. Ann NY Acad Sci 1968;150:874-94. 9. Cope O, Moore F. The redistribution of body water and fluid therapy of the burned patient. Ann Surg 1947;126:1010-45. 10. Willis MS, Carlson DL, DiMaio JM, White MD, White DJ, Adams GA, et al. Macrophage migration inhibitory factor mediates late cardiac dysfunction after burn injury. Am J Physiol Heart Circ Physiol 2005;288:H795-804. 11. Shwartz S. Consensus summary on fluid resuscitation. J Trauma 1979;19:876-7. 12. Chung KK, Blackbourne LH, Wolf SE, White CE, Renz EM, Cancio LC, et al. Evolution of burn resuscitaiton in operation Iraqi freedom. J Burn Care Res 2006;27:606-11. 13. Sullivan SR, Ahmadi AJ, Singh CN, Sires BS, Engrav LH, Gibran NS, et al. Elevated orbital pressure: Another untoward effect of massive resuscitation after burn injury. J Trauma 2006;60:72-6. 14. Hobson KG, Young KM, Ciraulo A, Palmieri TL, Greenhalgh DG. Release of abdominal compartment syndrome improves survival in patients with burn injury. J Trauma 2002;53:1129-33. 15. Markell K, Renz E, White CE, Albrecht ME, Blackbourne LH, Park MS, et al. 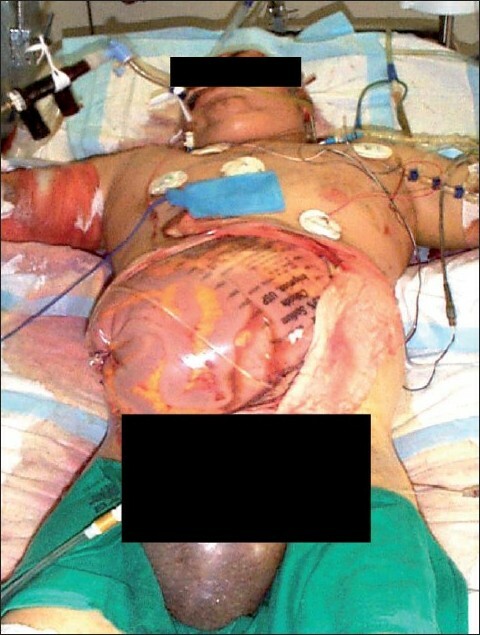 Abdominal complications following severe burns. J Am Coll Surg 2009;208:940-7. Available from: http://www.dtic.mil/cgi-bin/GetTRDoc?AD=ADA513481andLocation=U2anddoc=GetTRDoc.pdf [last accessed on 2010 Mar 15]. 16. Engrave LH, Colescott PL, Kemalyan N, Heimbach DM, Gibran NS, Solem LD, et al. A biopsy of the use of the baxter formula to resuscitate burns or do we do it like Charlie did it? J Burn Care Rehabil 2000;21:91-5. 17. Cartotto RC, Innes M, Musgrave MA, Gomes M, Cooper AB. 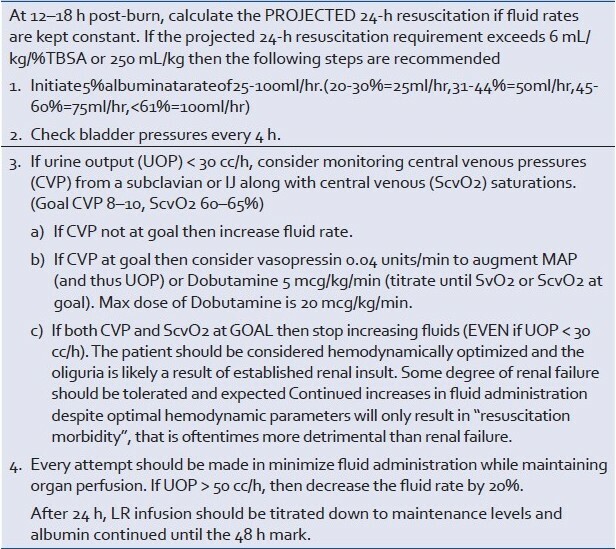 How well does the parkland formula estimate actual fluid resuscitation volumes? J Burn Care Rehabil 2002;23:258-65. 18. Cancio LC, Chavez S, Alvarado-Ortega M, Barillo DJ, Walker SC, MacManus AT, et al. Predicting increased fluid requirements during the resuscitation of thermally injured patients. J Trauma 2004;56:404-14. 19. Ivy ME, Atweh NA, Palmer J, Possenti PP, Pineau M, D′Aiuto M. Intra-abdominal hypertension and abdominal compartment syndrome in burn patients. J Trauma 2000;49:391-7. 20. Chung KK, Salinas J, Renz EM, Alvarade RA, King BT, Barillo DJ, et al. Simple derivation of the initial fluid rate for the resuscitation of severely burned adult combat casualties: In Silico validation of the rule of ten. J Trauma 2010;69:S49-54. 21. Saffle JR. The Pheonemon of "fluid creep" in acute burn resuscitation. J Burn Care Res 2007;28:382-95. 22. Pham TN, Cancio LC, Gibran NS. American Burn Association practice guidelines burn shock resuscitation. J Burn Care Res 2008;29:257-66. 23. Ennis JL, Chung KK, Renz EM, Barillo DJ, Albrecht MC, Jones JA, et al. Joint theater trauma system implementation of burn resuscitation guidelines improves outcomes in severely burned military casualties. J Trauma 2008;64:S146-52. 24. Salinas J, Drew G, Gallagher J, Cancio LC, Wolf SE, Wade CE, et al. Closed-loop and decision-assist resuscitation of burn patients. J Trauma 2008;64:S321-32. 25. Cochran A, Morris SE, Edelman LS, Saffle JR. Burn patient characteristics and outcomes following resuscitation with albumin. Burns 2007;33:25-30. 26. Lawrence A, Faraklas IM Watkins H, Allen A, Cochran A, Morris S, et al. Colloid administration normalizes resuscitation ratio and ameliorates "fluid creep". J Burn Care Res 2010;31:40-7. 27. O′Mara MS, Slater H, Goldfalb W, Caushaj PF. A prospective, randomized evaluation of intra-abdominal pressures with crystalloid and colloid resuscitation in burn patients. J Trauma 2005;58:1011-8. 28. Pham TN, Cho K, Warren AJ, Greenhalgh DG. Reduced hepatic expression of glutathione s-transferases in burned mice. J Trauma 2004;57:867-71. 29. Foldi V, Csontos C, Bogar L, Roth E, Lantos J. Effects of fluid resuscitation on burn trauma-induced oxidative stress. J Burn Care Res 2009;30:957-66. 30. Tanaka H, Matsuda T, Miyagantani Y, Yukioka T, Matsuda H, Shimazaki S. Reduction of resuscitation fluid volumes in severely burned patients using ascorbic acid administration: A randomized, prospective study. Arch Surg 2000;135:326-31. 31. Warden GD, Stratta RJ, Saffle JR, Kravitz M, Ninnemann JL. Plasma exchange therapy in patients failing to resuscitate from burn shock. J Trauma 1983;23:945-51. 32. Neff LP, Allman JM, Holmes JH. The use of therapeutic plasma exchange (TPE) in the setting of refractory burn shock. Burns 2010;36:372-8. 33. De Vriese AS, Colardyn FA, Philippe JJ, Vanholder RC, De Sutter JH, Lameire NH. Cytokine removal during continuous hemofiltration in septic patients. J Am Soc Nephrol 1999;10:846-53. 34. Chung K, Lundy J, Matson JR, Renz EM, White CE, King BT, et al. Continuous venovenous hemofiltration in severely burned patients with acute kidney injury: A cohort study. Crit Care 2009;13:R62. Atiyeh, B.S. and Dibo, S.A. and Ibrahim, A.E. and Zgheib, E.R. Park, S.H. and Hemmila, M.R. and Wahl, W.L. Salinas, J. and Cancio, L.C. and Renz, E.M. and Chung, K.K. and Mann-Salinas, E.A. and Wade, C.E. and Serio-Melvin, M. and Wolf, S.E.